Hello ... Hello ... my old friends ... It's great to see you once again! A second official press release was received by Yours Truly KJS and elobeatlesforever (elobf) over the weekend on the subject of The Beatles Vinyl Collection, as heavily advertised recently on TV, radio and social media here in the UK. 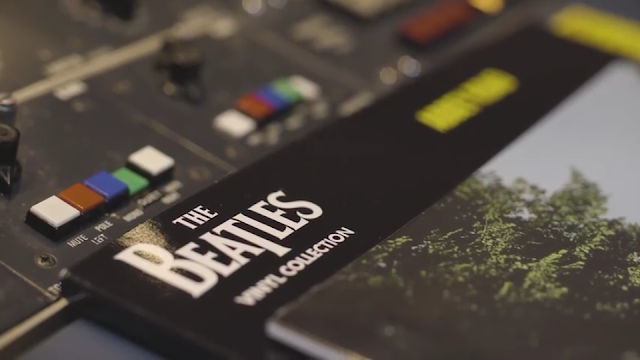 A video is now available to view featuring Sean Magee (the Abbey Road Mastering Engineer who cut the vinyl masters and oversaw the pressings of the new collection) as well as Beatles Historian and Radio Producer Kevin Howlett (who wrote the new Beatles Vinyl Collection magazines). The video (see below) contains brief interviews where The Beatles Vinyl Collection, the reason The Beatles' albums sound so good, the quality of the vinyl today versus that of 40 years ago and the importance of The Beatles' albums are discussed. The strong bonds between The Beatles, the formation of The Electric Light Orchestra and the ensuing career of Jeff Lynne mean that the many fans of ELO are also followers of The Fab Four (and vice versa). elobf is pleased to confirm that the 23 album collection will include both "Anthology 1" and "Anthology 2" which, of course, include the Jeff Lynne produced singles "Free As A Bird" and "Real Love". ​elobeatlesforever (elobf) recommends The Beatles Vinyl Collection to those enlightened folks who enjoy the music of ELO, Jeff Lynne, Roy Wood, The Move, The Idle Race, 'Brum Beat', The Beatles and related artistes.